The city is considering reconfiguring the bike lanes and/or parking on Drexel Boulevard from 39th and 51st, which is currently a fairly tranquil cycling route between Oakland and Hyde Park. The original, fully-funded Chicago Department of Transportation design calls for moving the bike lanes next to the grassy median, which would improve safety for cyclists because they wouldn’t have to worry about getting struck by opening car doors, among other benefits. However, due to requests from residents for more car parking, CDOT has floated an alternative scenario that would add extra parking lane next to the median instead. However, there’s no funding to pay for that version, it would have no safety benefits for cyclist, and the additional parked cars would obscure residents’ views of the attractive green space. According to CDOT, the first scenario would use funding from a federal Congestion Mitigation and Air Quality Improvement grant that is already approved, and the design is fully completed, so work can begin immediately on the two-mile stretch. Along with removing the dooring hazard, this layout would eliminate conflicts between the bike lanes and 11 “T” intersections. Cyclists would also get a nicer view the median to their left, an upgrade from the status quo of traveling between parked cars and moving vehicles. The downside of relocating the bike lanes next to the median is that it’s likely drivers will park in them on Sundays. There are several churches along Drexel and, as is in the case on many of Chicago’s multi-lane boulevards, parishioners park on the inside travel lanes during services. This is technically illegal, but local aldermen invariably condone the practice, arguing that it’s a neighborhood tradition. CDOT spokesman Mike Claffey acknowledged that, since there are no plans for plastic posts or concrete curbs to discourage churchgoers from continuing to park by the median, it’s likely that the new bike lanes would be blocked by cars on some stretches on Sundays. A CDOT rendering of the design goes as far as to state that it “allows for parking against the median during church services,” even though there is no indication that the practice will be legalized. However, Claffey added that at other times parking demand is low enough that it’s more likely motorists will park in the outside parking lanes. Kyle Terry, an urban planner and real estate analyst who lives just south of King’s Ward in Hyde Park says that while he thinks moving the bike lanes next to the median would be beneficial overall, adding new parking lanes is a bad idea. “The issues are safety, aesthetics, and induced demand [the phenomenon of more people choosing to dive when driving is made easier],” he said. “They should reward people for getting out of their cars with a beautiful, safe ride. Terry noted that under Proposal 2, cyclists could still get doored by people leaving their cars, and parked cars next to the medians could make it harder for motorists and pedestrians crossing the boulevard to see each other. Streetsblog’s Steven Vance noted that, according to Illinois Department of Transportation traffic counts, four-lane Drexel sees an average of only 1,400 cars a day in each direction. 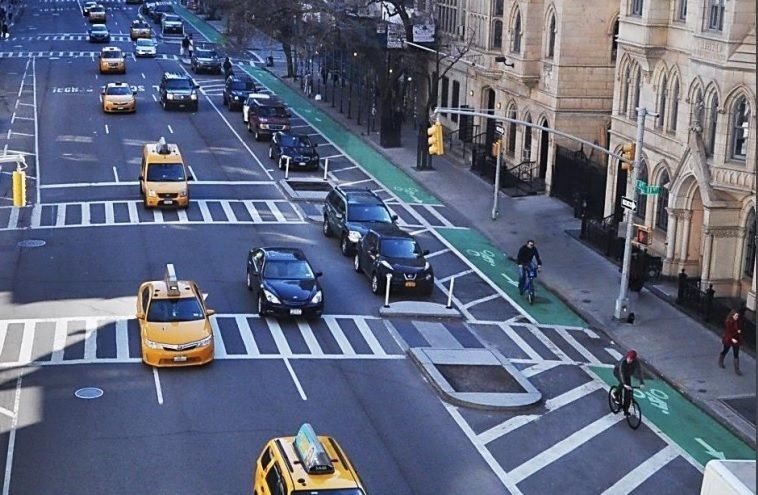 Studies show that a two-lane street with turn lanes can accommodate up to 20,000 cars a day without undue congestion. Therefore, Steven argued, there would be no traffic impacts if travel lanes were eliminated on each side of the boulevard to make room for converting the existing parking lanes to diagonal parking, creating more capacity. That would make it possible to add bike lanes next to the median with curb protection, or at least flexible posts. Alderman King encourages anyone with an opinion about the matter to contact her office at ward04[at]cityofchicago.org or (773) 536-8103, but of course the opinions of people who live in the ward will hold more weight. Streetsblog Chicago will resume publication on Tuesday. Have a great Memorial Day! Just a thought, but why not completely protect bicycles and create an awesome path on the boulevard median? I’ve see this a lot in Europe and just seems the safest bicycle lanes are those that are separated from vehicles on the street by barriers or on medians like very wide option on Drexel. Have any plans like this been presented? That sidewalk is 6 feet wide………you cant bike on that? Biking on a sidewalk as an adult is illegal in Chicago. Do you have a specific example of a bike lane like this in Europe as you suggest? I can’t picture it. It would be very difficult to design safe intersections with a path on the boulevard median. Cyclists would be out of site out of mind and in a location that most drivers wouldn’t be expecting or looking for them. Left hooks would be particularly problematic. I know dooring is an issue but why don’t they instead put the bike lanes all the way on the right then include a buffer (painted or preferably a raised curb) and then allow street parking just left of the buffer. Creating a protected bike lane. I’m not sure if there was a specific reason that the bike lane was being put on the left side and kept away from the right side other than dooring. I used Drexel as a part of my route for a number of years (Lakeview to Woodlawn). My morning commute was a delight. Afternoons saw more traffic but still made for a relatively smooth stretch with little friction. Beautiful stretch of city. Love the idea of redesign and preparing the road for a more dense future. Anyways, you get the idea… I’ve pulled up so many others. I’ve been to 60 countries and we are just so far behind and the when we do talk steps to create lanes, it’s just so backward and messed up compared to virtually any country I’ve visited. It’s just see easy to find great examples all over the world that would fit the spaces we have in Chicago. Wish we could implement some of these truly protected systems instead of just painting a few lines in the street that completely fade away and then having to rely on everyone’s memory to ride/drive/walk where they are supposed to go based on the old, faded lines (and that’s assuming they’ve ever actually been traveled the route that used to have the lines)! Sorry, there was some confusion. I was asking about boulevard placement of bike infra. I haven’t seen this anywhere in Europe (a few examples of a couple of paths under the S-Bahn in Berlin notwithstanding) so I was wondering if you had. Yes, it is an option which can work in certain applications – especially where the boulevard is a thoroughfare where the majority of cars are not making left turns and cross traffic is limited- But even there, this is really only benefiting the strong daily commuter and does little for the neighborhood users from eight to 80. I’m all for innovation and new ideas, but for the time being it seems to just simply ask the question ‘what would the Netherlands do’ to keep the evaluation of any ideas simple. The Netherlands doesn’t do this. Hey Guy, There are plenty of boulevard bike paths in the Netherlands including 100s of off-street, on sidewalk dedicated and protected bike lanes. The way they handle the left turns all over Amsterdam and the Netherlands – and in Copenhagen/Denmark – is with bicycle only street lights. You simply can’t ride a bicycle in either country without seeing them everywhere. So, I guess I’m wondering if you’ve actually ever been to the Netherlands or Denmark?! These types of protected lanes, boulevard lanes along with dedicated right and left turn light protection are all over the place. Literally 100s of them between the two countries alone – and throughout the rest of Europe and the world for that matter. It is only here in Chicago, then when given a fantastic opportunity like Drexel to create an awesome, protected and safe bicycle way that we instead paint a few lines on the street. Why? Money?! Are we really saving that much? The Chicago Boulevard system along with ultra wide sidewalk on some streets like Division in Wicker Park are all great – but missed opportunities – to making safer in America and exactly “what the Netherlands would do”. Again, I am only taking issue with placing a bike lane in the middle of a boulevard (between opposing lanes of travel) and if this is best practice. And again, if you notice, there is not a single example of this in what you provided. The reason I ask is that I have spent time in the Netherlands including but not limited to a 150 km bike ride around Limburg this past weekend. I have not seen a single example of it….. again, that’s why I’m asking. Well, I’ve tried very hard to provide you factual examples Guy, but I’m about ready to give up. With all due respect, facts and photos are not semantics… they are facts. I’ve posted many, many examples of this EXACT example of bicycle lane in Europe – and the Netherlands – and all over the world in the middle of green strips on boulevards some with dedicated bicycle stop lights used to protect pedestrians and bicycles from turning vehicles. Injury rates are miniscule compared to here using these types of protected boulevard systems. I lived in Malmo for 2 years on a work visa – right across from Copenhagen and spent a ton of time in Amsterdam. A dedicated protected lane on the boulevard system in Chicago with dedicated lights for turns, is EXACTLY what the Netherlands would do. I guess I just don’t understand why you would not want a system dedicated to protecting bicycle riders… this a proven system and would be a huge success here. Mr. Greenfield, if you are following this post, perhaps we could please have your opinion on the effectiveness on a protected boulevard lane system with dedicated turning lights in Chicago? I know you posted a photo from Asia and I know you’ve spent time overseas – could you shed some light on this working concept? I just think the transportation alliance and others are missing a great opportunity on Drexel and throughout the Chicago boulevard system and would be great to hear from you on this topic. At a minimum, Drexel would be a great proof of concept test here in Chicago… Thanks! You don’t walk much, do you, Lazy. The problem I observe biking along Drexel is double-parking in the bike lane, even when there is a readily available space just a few cars spaces down. The bike lane is consistently ignored as a dedicated bike lane. Residents sensibly voted for the street layout that made the street safer, rather than more car-centric, less safe, and less attractive.